BACKGROUND AND PURPOSE: Recent studies on stent placement of significant stenoses at the origin of the vertebral artery reported excellent immediate results. Long-term outcomes, however, were disappointing due to high restenosis rates and stent breakage. In the present study, we evaluated the application of a short drug-eluting balloon-expandable coronary stent for the endovascular treatment of these frequent lesions. MATERIALS AND METHODS: In a period of 23 months, 48 patients (12 women, 36 men) with a mean age of 68 years (range, 46–82 years) harboring 52 significant ostial vertebral artery stenoses underwent treatment with short (8 mm) balloon-expandable paclitaxel-eluting coronary stents. Stents were deployed as closely as possible so that the proximal end was just at the origin of the vertebral artery, with high inflation pressure applied. Patients were under continuous medication with acetylsalicylic acid and clopidogrel before and after the treatment. Follow-up clinical assessment and angiography were performed in all patients. RESULTS: Periprocedural complications were not encountered. Stenosis severity was reduced from 62 ± 2% (mean ± standard error of the mean) preprocedurally to 15 ± 2% postprocedurally. Follow-up angiography at 7.7 ± 0.6 months revealed a mean stenosis degree of 24 ± 3%. None of the patients developed posterior circulation symptoms related to the treated segment during the follow-up period. Recurrent stenosis (>50%) at follow-up was found in 6 (12%) lesions. CONCLUSIONS: Stent placement of significant ostial vertebral artery stenosis by using short drug-eluting stents is safe and yields good midterm patency rates and excellent protection from posterior circulation ischemia. Stenosis of the ostium (V0) and the proximal segment (V1) of the vertebral artery is a common cause of vertebrobasilar ischemia and an embolic source in the posterior circulation.1,2 Surgical treatment of these lesions is technically challenging and is associated with substantial morbidity and mortality.3,4 Endovascular treatment with balloon angioplasty alone yields unsatisfactory results due to elastic recoil, vessel dissection, and high restenosis rates.5,6 Studies on stent placement of ostial vertebral artery lesions by using bare metal stents have reported excellent immediate results and low rates of periprocedural complications; however, mid- and long-term results remained disappointing due to issues of stent fracture caused by mechanical strain7–9 and high rates of in-stent restenosis as a result of neointimal hyperplasia.7,10,11 The use of drug-eluting coronary stents (DES) for the prevention of in-stent restenosis in ostial vertebral artery stenotic lesions has been advocated recently.12–16 However, follow-up restenosis rates are widely scattered in these studies, ranging from 0% to 63%. This uncertainty may be partly attributable to the relatively small number of treated stenoses with angiographic follow-up (n = 2–8) in most of these studies, with the exception of the report of Gupta et al,15 who analyzed 27 vertebral ostial stenoses treated with DES and reported significant (>50%) in-stent restenosis in 7% of the cases after a mean follow-up period of 4 months. Another issue hampering the interpretation of the available studies with DES is that the investigators did not confine the applied stents to 1 type, sometimes not even within the same study. In the present article, we report midterm clinical and angiographic follow-up results in 52 significant stenoses of the vertebral artery ostium, treated with stent angioplasty by using a short balloon-expandable DES. Forty-eight patients (12 women, 36 men) with a mean age of 68 years (range, 46–82 years) harboring 52 significant ostial vertebral artery stenoses underwent stent placement of the vertebral artery origin during a 23-month period between April 2007 and February 2009 at our institution. Informed consent (including the fact that the stent was used off-label) was obtained from each patient before the intervention and follow-up angiography. A 6F-8F guiding catheter was then inserted into the subclavian artery, and the stenosis was passed under road-mapping with a 0.014-inch (0.35 mm) guidewire. A short (length, 8 mm; diameter, 4 mm) balloon-expandable paclitaxel-eluting coronary stent (Coroflex Please; B. Braun, Melsungen, Germany) was carefully placed into the stenosed segment under fluoroscopic guidance by using 11-cm image-intensifier diameter and an x-ray pulse rate of 30 frames per second. Care was taken to place the proximal end of the stent as close as possible to the upper contour of the subclavian artery. The stent was deployed first by manual inflation of the balloon to achieve better controllability, which was followed by controlled inflation to 13 atm by using a manometer. Stents of the same type and size were used in all patients in the present study. Following the deflation of the balloon, control angiography was performed and the degree of residual stenosis was determined. All patients were scheduled for follow-up, which included assessment of the neurologic status, history of neurologic symptoms, and MR imaging and angiographic examination at 6 weeks (at the time of writing, 6 patients), 12 weeks (13 patients), 6 months (15 patients), and 12 months (14 patients) after the endovascular treatment. The clinical characteristics of the study group are presented in Table 1. The degree of stenosis of vertebral artery origin was reduced from 62 ± 2% (mean ± standard error of the mean) preprocedurally to 15 ± 2% postprocedurally. An illustrative case is presented in Fig 1. Periprocedural technical or clinical complications were not encountered. None of the patients developed symptoms of vertebrobasilar ischemia related to the treated vertebral artery segment during the procedure or in the follow-up period. Representative angiographic images from patients with significant vertebral ostial stenosis. A–C, Preprocedural (A), postprocedural (B), and 5-month follow-up (C) images in a 62-year-old male patient. D–F, Preprocedural (D), postprocedural (E), and 4-month follow-up (F) images in a 68-year-old male patient with significant stenosis of the left vertebral ostium. Angiographic follow-up performed at a mean of 7.7 ± 0.6 months (range, 2–15 months) revealed a mean stenosis degree of 24 ± 3%. 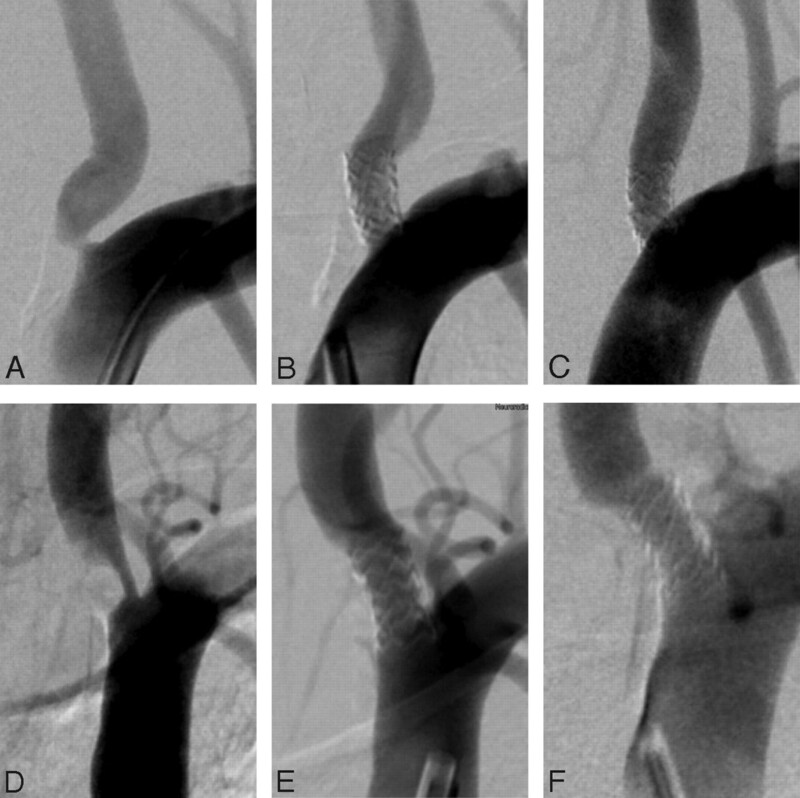 In 6 cases (12%), the severity of the stenosis on the follow-up angiography exceeded 50%. In 15 patients (29%), we had angiographic follow-up ≥12 months after treatment. In 3 of those, a recurrent in-stent stenosis of >50% was found; and in 1 of these patients, the in-stent restenosis was found to be progressive between 6- and 15-month follow-up angiography. Patients with significant restenosis are scheduled for retreatment using the same method. In the present study, we report midterm clinical and angiographic follow-up results in 52 ostial vertebral artery lesions treated with short balloon-expandable paclitaxel-eluting stents, placed exactly at the orifice of the vertebral artery and deployed with high inflation pressure. To our knowledge, this is the highest number of patients treated with DES so far. Our midterm (7 months) clinical follow-up data without any ischemic event in the posterior circulation indicates that stent placement of ostial vertebral artery stenotic lesions with DES is safe, even when performed without a distal protection device.21 The midterm rate of significant restenosis in 12% of patients, without target-lesion–related morbidity or mortality is acceptable. In principle, an additional rate of in-stent restenosis during the long-term follow-up is possible; however, in our series of patients with >1 year follow-up, it was infrequently observed (1 of 15 patients). In this study, stent placement of vertebral artery stenosis by using short DES was safe and yielded good midterm patency rates. In our experience, short DES, deployed with high pressure and placed with the proximal end as close as possible to the level of the subclavian artery, are less prone to intimal hyperplasia, recurrent stenosis, and stent breakage. SSYLVIA Study Investigators. Stenting of Symptomatic Atherosclerotic Lesions in the Vertebral or Intracranial Arteries (SSYLVIA): study results. Stroke 2004;35:1388–92.
. Drug-eluting stent safety. Am J Cardiol 2007;100:10M–17M.